As far as entry-level spotting scopes are concerned, you really can’t do much better than something from legendary optics brand Leupold. The Leupold SX-1 Ventana 2 spotting scope is certainly one of the best options money can buy, particularly if you aren’t looking to spend a small fortune on a spotting scope before you are sure you’re ready for something is feature-rich or as overbuilt as that price tag would command. The Leupold SX-1 Ventana 2 is available in two different configurations, the 15/45 x 60 mm and the 20/60 x 80 mm configurations, and can be purchased as both a straight spotting scope (which we are reviewing in this quick guide as well as an angled spotting scope. Both of these configurations come with a top-quality carrying case and a handful of accessories that we will highlight in just a moment, making this entry-level spotting scope one of the smartest purchases you could make – particularly if this is the first scope you are getting your hands on. Measuring in at about 13.5 inches and weighing just 30.6 ounces, this isn’t exactly an ultracompact spotting scope – but it is in some monstrosity that you are going to regret carrying with you into the bush or out to the field, either. As far as quality concerns are considered when it comes to a spotting scope at this affordable of a price tag, you don’t have anything to worry about. This is, after all, a spotting scope that carries the Leupold brand name, one of the most recognized (internationally, even) and one of the most respected companies in the optics world today. … As well as an instructional manual, maintenance care guide, and information about your warranty directly from the folks at Leupold. That’s a pretty decent amount of accessories to get up and running with the Leupold SX-1 Ventana 2 spotting scope, and all of them have the same kind of durability that you’d expect from any product bearing the Leupold name. We would be remiss not to mention – right out of the gate, no less – just how impressive the Leupold SX-1 Ventana 2 spotting scope is, particularly at this price tag. This is about as affordable a spotting scope as you are going to find anywhere on the market today (above the cheap department store options that aren’t worth the box they come in), but still has the kind of quality optics and specialty features that you’d expect from any of the Leupold branded optics. Another huge benefit of the Leupold SX-1 Ventana 2 has to be the interchangeable eyepiece mechanism that it includes, and innovation that the folks at Leupold have really helped to pioneer and innovation that has allowed them to produce standardize equipment that can be customized to the user in particular – dramatically improving the comfort of using these optics while at the same time dialing it in to your exact configuration settings without any headache or hassle whatsoever. The Leupold SX-1 Ventana 2 spotting scope also includes a very tight focus distance, giving you the ability to dial in this straight spotting scope with incredible precision without ever losing the target that you are citing at the same time. 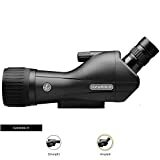 The user control system for the magnification ring as well as the focus adjustment platform is intuitive to use and straightforward, without any real manipulation difficulty even if this is the first spotting scope that you have ever used. The inclusion of a quality tripod and hard case for protection and storage is another huge benefit of this spotting scope. The tripod is quality across the board and not some cheap “throw in”, but instead something that you are going to be able to leverage for years and years to come. Of course, like all other Leupold products, the Leupold SX-1 Ventana 2 spotting scope includes the Gold Ring Guarantee. This lifetime warranty protects every square inch of your Leupold SX-1 Ventana 2 spotting scope, giving you a lot of peace of mind to take full advantage of everything it offers even the most challenging of settings and situations without fear of breaking something that cannot be repaired or replaced. There aren’t a lot of things to be disappointed in when you are talking about the Leupold SX-1 Ventana 2 spotting scope. It certainly would have been nice to see a handful of other accessories (including a car mount or adapter kit, perhaps) thrown into the mix when you purchase a spotting scope like this, but at the end of the day the ridiculously low price tag connected with the Leupold SX-1 Ventana 2 scope excuses the lack of inclusion of those kinds of accessories. All things considered, the Leupold SX-1 Ventana 2 is one of the top-notch spotting scope money can buy – particularly at this price point, but really almost any price point (aside from the really high-end options out there right now). If you want to get your hands on a quality piece of equipment from a brand-name you know you can trust, a name with decades of tradition behind the reputation for making only the finest optics on the market today (especially for outdoors people, shooters, hunters, and those looking for adventure), you really can’t go wrong with the Leupold SX-1 Ventana 2 spotting scope. Quality components are used across the board, it features the legendary Leupold reputation for engineering and design, and its usability is about as straightforward and as simple as can be. This is a perfect addition to your kit!